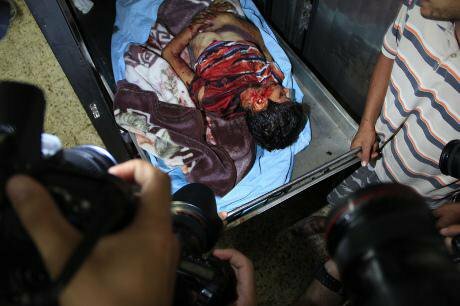 Death in war's spotlight: a Palestinian child in a Gaza hospital morgue. Ahmed Hjazy / Demotix. All rights reserved.The seemingly dormant Israeli-Palestinian conflict has reawakened. A sequence of events triggered by the kidnapping and murder of three Israeli students and the burning alive of a Palestinian teenager has seen the region descend once again into a vortex of violence. Settler attacks on Palestinian civilians, Israeli raids and arrests, Palestinian rioting in the west bank and east Jerusalem, rocket fire from Gaza, the launch of Israel’s “Operation Protective Edge” with mounting Palestinian casualties and the threat of an Israeli ground operation in the strip have raised the spectre of a third intifada. In light of this escalation, the predictable failure of talks mediated by the US secretary of state, John Kerry, and the all-round regional chaos, what should the European Union and its member states do? The EU has never been and is unlikely to be a mediator in Israel-Palestine. Yet it has historically played a pioneering role in the conflict. From the Venice Declaration in 1980 to outright support for a two-state solution in 2001, the EU has repeatedly demonstrated an ability to be ahead of the curve. And, away from the media spotlight, the last decade has slowly but surely seen the EU changing the paradigm governing its relations with Israel and Palestine, shifting away from political discretion towards rule-bound action. Pursuing this pioneering path in the Middle East “peace process” is a responsibility the EU cannot elude. Following the victory of Hamas in the 2006 Palestinian legislative elections and in the framework of the Middle East Quartet, the EU endorsed and implemented highly discretionary sanctions towards the elected Palestinian government—after the split between Fatah and Hamas, specifically the Hamas-led administration in Gaza. While the condition of non-violence is sacrosanct and firmly embedded in international law, the remaining conditions were highly political and almost designed so as not to be fulfilled. That policy of conditionality was premised on the hope and expectation that Hamas would at worst capitulate and at best wither away. Notwithstanding almost a decade of sanctions, the policy has dismally failed. Even in the west bank, the resistance movement has anything but vanished. Implicitly acknowledging the bankruptcy of the policy, the EU (and the US) tacitly nodded at the Palestinian government formed via agreement between the factions in 2014. While igniting Israeli ire, this technocratic coalition (arguably closer to the Palestinian Authority than to Hamas) became the first sign of intra-Palestinian reconciliation since the collapse of the “national unity” government in 2007. The challenges to the survival of the new government are however monumental. Not only does it have to withstand Israel’s onslaught on Gaza but it must also pursue the structurally complex task of reunification after seven years of physical separation, mistrust and animosity. The Ramallah-based Palestinian Authority still has no presence in the strip. The 50,000 civil servants in Gaza hired by the Hamas authority have not received their salaries since the government’s formation; the PA lacks the funds to pay them and fears that doing so would trigger EU and US retaliation. And the reintegration of the PA and Hamas security apparatuses remains a distant prospect, not to speak of the rehabilitation and reconstruction of Gaza—the more so after the current wave of violence. In this context, the EU is called upon to put its money where its mouth is. If indeed it supports Palestinian reconciliation and accepts the current technical government, it should do what to takes to ensure its survival. With the odds stacked so heavily against it, active support rather than passive acceptance is essential. When it comes to dealing with Israel, recent years have witnessed the evolution of an EU consensus on rule-bound action. For decades, the EU accepted a binary policy divide—co-operation versus pressure—in which the intra-EU tide weighed heavily in favour of the former. Over time and with mounting headaches caused by the EU’s bending of the rules so as not to upset its political relations within Israel—take, for instance, the decades-old problem of product-origin rules and the EU’s preferential treatment of Israeli settlement products—the tune has started to change. Rather than the either/or, carrot/stick approach, rule-bound co-operation is increasingly becoming the only and most desirable third way. Not only is it the only feasible route for a rule-based EU to maintain and deepen co-operation with Israel. It is also the most effective strategy to temper, rather than fuel, the dynamics of the conflict. In this context, the EU is called upon to put its money where its mouth is. The 2013 EU guidelines on funding to Israel, which explicitly excluded as beneficiaries Israeli entities in the occupied territories, represent the first evidence of this new approach. The guidelines are important not because their implementation will cause financial damage to the settlement enterprise, still less because such damage might induce Israel to end the occupation. They are however crucial—hence the uproar they occasioned in Israel—because for the first time EU practice has aligned with its declaratory support for international humanitarian law and the two-state solution. The effectiveness of this policy is demonstrated by Israel’s ultimate acceptance of the guidelines. Criticism notwithstanding, the Israeli government did not slam the door in the EU’s face. It ultimately signed up to the EU Horizon 2020 programme, contenting itself with an annexed declaration in which it restated its domestic position without this having any legal consequence for the EU. When the EU presented its position to Israel as a legal necessity and not as a discretionary political act, Israel screamed and shouted but ultimately complied. The challenge today is of pursuing this path and making the funding guidelines the harbinger of a new approach, rather than an incidental digression from old habits. The EU high representative, Catherine Ashton, had promised a new set of guidelines on the labelling of Israeli products, indicating their exact origin, thus allowing EU consumers to make informed choices. But those guidelines never appeared, as the EU was once again put under the magic spell of the “peace process” and its relaunch under Kerry’s impulse. Rather than viewing the labelling guidelines as another small step assisting the US-led peace effort, the EU and its member states suspended the work on them. Following the appointment of the new EU high representative, that work should be revived. It should be pursued even more vigorously if Israeli-Palestinian negotiations were to be renewed. What these episodes reveal is the EU’s ability to signal to Israel and the wider world the broader principle governing the conduct of its bilateral relations. Once that rule-based principle is fully internalised, its scope for application is infinite—from police co-operation to EU assistance for the Israeli-controlled “area C” in the west bank. When put together and conceptualised as a coherent strategy, its appeal may spread beyond the EU, perhaps one day reaching the other side of the Atlantic. What then about the “peace process”? When the Kerry-mediated talks were launched, few believed they would finally deliver the two-state solution painstakingly delineated over the two decades since Oslo. And yet the international community, in primis the EU, religiously praised the process and prayed for its success. The candid explained that blind faith was obligatory: negotiations might not resolve the conflict but they would prevent its escalation at a time of mounting regional chaos and, anyway, there was no alternative. Events over the last few days have revealed the fallacy of this reasoning. A process destined to fail—after two decades it is difficult to argue otherwise—cannot be taken to be better than no process at all. Indeed, it creates hopes which, when dashed, increase rather than reduce the chances of escalation; hence the pattern of a conflict frequently punctuated by violent eruptions. Furthermore, dogmatic insistence shuts down all space for creative thinking about alternative processes and end-points, as Europe pioneered as far back as 1980. The EU is not a mediator but it does have a role and responsibility. It also has high stakes in the resolution of a conflict in which it has invested so heavily. After 20 years of funding to support a Palestinian state which has precious little chance of seeing the light of day, it is legitimate for the EU to ask whether this continues to be a realistic way forward. That is not to say that the EU should abandon the goal of a two-state solution or turn its back on the “peace process”. Rather, it should open up a debate, at least internally, on the fundamentals of the process and its presumed conclusion. The Middle East today is unrecognisably different from the early 1990s, when the building-blocks of Oslo were put in place. The EU cannot blindly assume that the Oslo acquis remains relevant today, out of sheer terror of contemplating alternatives. Precisely because the EU does not bear upon its shoulders the responsibilities of mediation, it should use its freedom and its duty towards the conflict parties to engage in an out-of-the-box discussion on the possible way ahead.